Her majesty Queen Elizabeth II and the Duke of Edinburgh came to Jamestown Settlement on May 4, 2007 as part of a two-day visit to Virginia that included stops at the state capitol in Richmond, Colonial Williamsburg and Historic Jamestowne. The royal visit at Jamestown Settlement began with a dramatic presentation in the re-created 1610-14 fort, a welcome from Jamestown-Yorktown Foundation Co-Chairman Thomas K. Norment, Jr., and remarks by U.S. Vice President Richard B.Cheney and Justice Sandra Day O’Connor, honorary chair of America’s 400th Anniversary. The presentation, “Historic Links and Bonds of Friendship,” developed in partnership with the Colonial Williamsburg Foundation, chronicled the history of the relationship between Britain and America over the past 400 years, with a reference to the 50 years that have passed since the Queen’s and Duke of Edinburgh’s last visit in 1957. 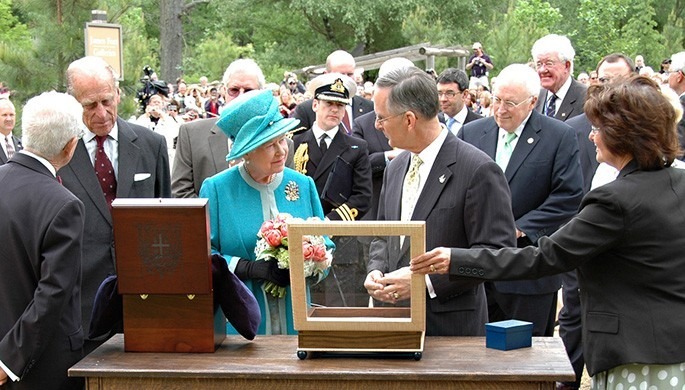 The Queen then toured the three “public” buildings in the fort – guardhouse, storehouse and church, where students were engaged in a program about the role of religion at Jamestown – while the Duke of Edinburgh toured the Susan Constant and observed students participating in a demonstration of 17th-century navigation. About 1,200 people, including invited guests and members of the general public and education groups, were on hand to witness the visit, which also was broadcast on a large screen on the museum mall. 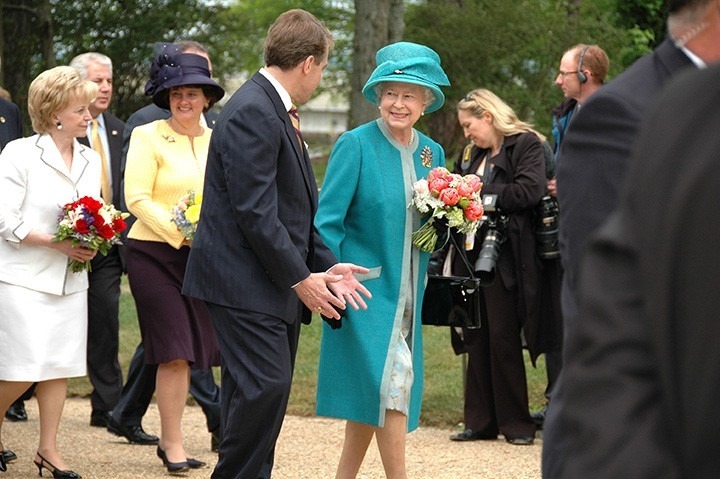 Queen Elizabeth II at Jamestown Settlement, May 4, 2007. 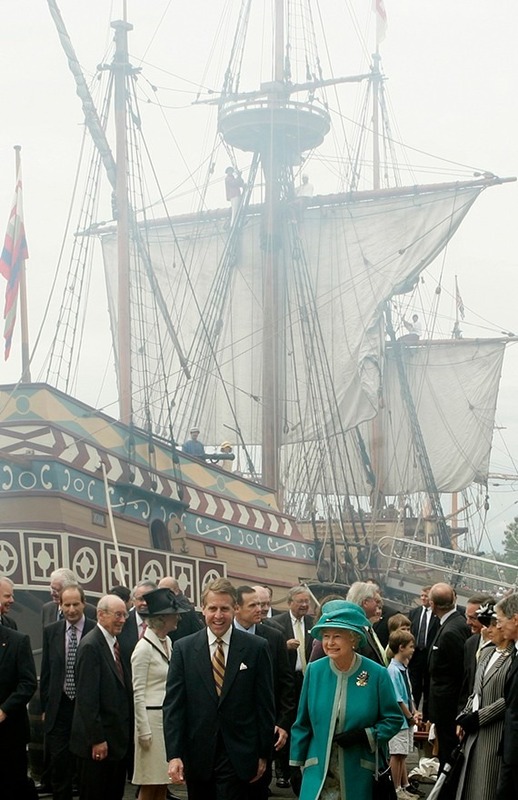 Queen Elizabeth II is escorted by the “Susan Constant” ship at Jamestown Settlement. Photo by Jim Young/Reuters/pool. The Jamestown-Yorktown Foundation presents gifts to the royal couple. 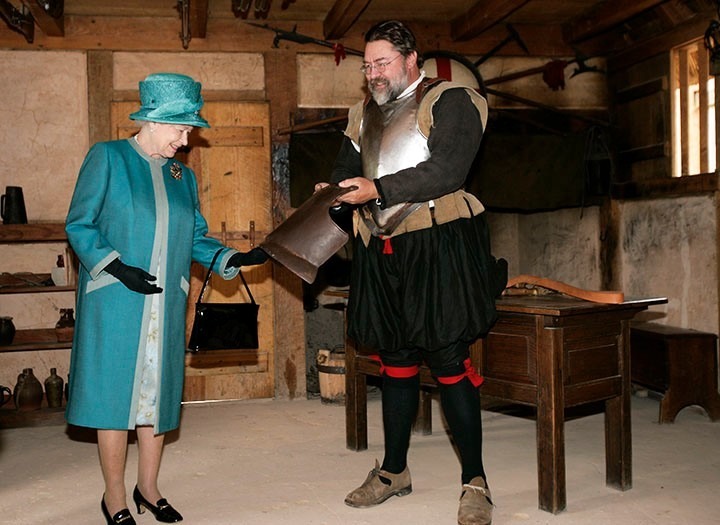 Queen Elizabeth II examines a piece of armor. Photo by Steve Heiber, Associated Press/pool. The Queen and Duke of Edinburgh are welcomed at Jamestown Settlement.